The stage at the Theater of Geneva had been transformed into a stunning shrine, brilliant in color yet intimate and warm in feeling. The back of the stage was hung with tall scroll paintings of the Buddha flanked by Avalokiteshvara and the Medicine Buddha while below sixteen goddesses made their offerings. 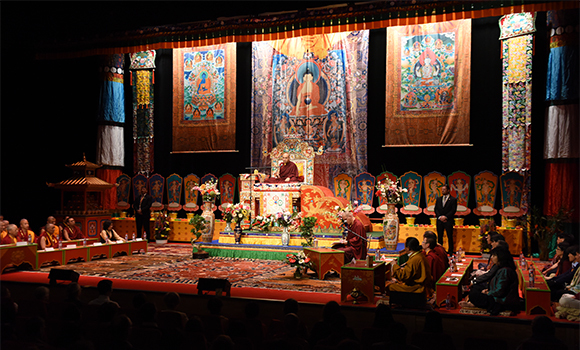 Behind a row of elegant flower arrangements, a magnificent golden throne for the Karmapa occupied stage center. Rows of cushioned rugs on stage right and left were filled with the ordained and lay Sanghas. Taking his seat on the throne, the Karmapa began his talk by extending his greetings to the audience, and especially to the Tibetans who had come. He remarked that after they left Tibet, Switzerland was one of the first countries to receive Tibetans so there is a long history of connections between the two people. The Karmapa also extended his thanks to Namkha Rinpoche for working so diligently to make this visit possible. The topic of today’s teaching was on the practice of meditation and how to develop well-being and peace within our minds. The Karmapa began by saying that a Google search on the words “Buddhism,” “mindfulness” and “meditation” will bring up many more hits for the later two than for “Buddhism.” This indicates that people are not as interested in religion as they are in meditation and developing mindfulness. “When we talk about meditation in general,” the Karmapa continued, “we usually speak of three different types or categories of people⎯superior, middling and inferior. This later one has two divisions: the principal, and the ordinary. The second one is only interested in the things of this world, yet these days many people are interested in meditation.” The Karmapa cautioned, however, that everything is becoming commercialized and that meditation, too, may also become just one more thing to sell. The danger, he said, is that it would lose its deeper meaning. There are many instructions, he noted, on how to sit properly, but the main thing is that our body is straight. The Karmapa commented, “If our mind is relaxed, then our body will also be relaxed and settled into itself.” When this happens, we can pay attention to the breath as it comes and goes. Our breathing is an object of meditation that we always have, he said, so it is easy to look at our breath and relax our mind. It is not something new and there is nothing special to do. The Karmapa asked the audience to follow his guidance so that everyone could meditate together. First, he said, we can note the tension in our mind, and then let go of all concepts about the past or the future, staying with the present moment and resting there. He commented that usually we think that the breath is not important so we do not pay attention to it. Breath, however, is fundamental. Once our mind is relaxed, he counseled, we follow the breath with mindfulness as we inhale and exhale in an uninterrupted flow. Without any special effort, just noticing that this movement is happening creates a basis for the mind, he said. It looses its heaviness, becoming smooth and light like the air we breathe. Without a lot of distraction, he said, we continue like this. There are some people, he noted, who count the cycles of breath up to twenty-one and then begin again. We should check and see if this helps us or not. In relation to the breath, he suggested, we can also think that oxygen is always present sustaining our lives, and we can be joyful about this simple fact, or be happy just to be breathing clean air. Usually we do not think that our breath is something extraordinary, but from another point of view, it is wondrous. In this way, the Karmapa said, we can find happiness in simple things. Focusing on the breath, naturally teaches us to look inward and away from the outer world. Buddhism offers, he remarked, many ways to meditate and discussions of how to reach the level of buddhahood. This practice with the breath, however, helps us to find peacefulness, the basis for all the other practices, as well as happiness so we should continually train our mind this way.